Automatic oil press is one new oil press equipment that our company has developed independently in recent years. Equipped with automatic temperature rising and oil-cleaning system, this type of automatic oil press equipment is able to do both cold press and hot press. Meanwhile, the design of the automatic oil press is novel and performance is perfect, and as it requires low investment and generates high profit, so the machine covering small space, performing perfectly, and its easy-to-operate is quite suitable for those who do business in the country market or who run a small- scale oil mill. As people could see the whole process of oil pressing, they believe it’s clean and reliable. 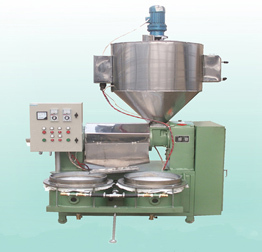 Automatic oil presses are advanced model from the screw oil press. These include motor, vacuum, filter, heater and electric control cabinet. The assistant part can help the automatic oil press with higher output. The function of the vacuum oil filter used to filtrate the crude oil which come out from oil press. They are an ideal choice for customers. Our company have full specifications of various small oil press equipment. With reasonable pricess, our oil expellers are suitable for consumer groups of different levels. Our main products include complete automated screw oil expellers, YZS series screw oil press, special oil presses for sesame or peanuts and accessories for oil extraction. We will service all the users with zealous attitude and best product. Our small oil expeller featured easy operation, high efficiency etc. The press invented by our company have human design, automatically open and stop. Easy to operate, safe working, even the unprofessionals can learn how to use it very easily. From feeding material to pressing clean oil, it is fast and efficient. Welcome to contact us in the follong form to get further info about our automatic oil press, we are always at your service!